Mike Moritz, arguably one of the few super VCs, has been diagnosed with a rare, incurable medical condition and has decided to take a step back from active daily duties at Sequoia Capital. He still intends to continue making investments and also work with younger partners at the firm. Moritz is part of a rare breed of uber-VCs who have had multiple billion dollar exits. Moritz, John Doerr, Vinod Khosla, Jim Breyer and Fred Wilson belong to this super club. 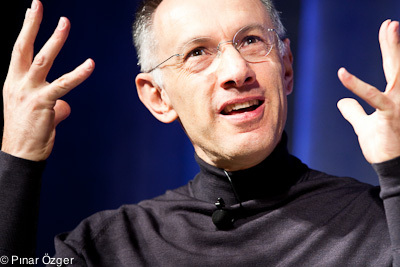 Moritz, who spent early part of his life as a journalist and wrote for Time magazine, is well known for his investments in Google, Yahoo and PayPal. Moritz spoke at our RoadMap conference last November and is a big champion of finding investment opportunities in India, China and other parts of the world. Moritz also wrote the seminal Apple book, The Little Kingdom. On a more personal note, I have gotten to know Mike over the years and I am stunned by this development. He informed the firm’s limited partners in a note earlier today. This is the text of the email that was sent out. We have always tried to be straightforward with you and, in that spirt, I need to share something. Unfortunately, I have been diagnosed with a rare medical condition which can be managed but is incurable. I’ve been told that in the next five to ten years the quality of my life is quite likely to decline. Right now I feel fitter than ever and I hope that I’ll be one of the lucky ones who can live a full life and defy the statisticians. But there is no way of predicting this with certainty and thus for me, life has assumed a different meaning and I am making some adjustments. I am going to extract myself from the daily management of Sequoia Capital, a task that has consumed a large part of my time for the past sixteen years. I will become Chairman of Sequoia Capital and will be deeply involved with nurturing the fresh investments, ideas and relationships that can be of significant long-term benefit for all of us. I will also work very closely with some of our younger and newer members, will continue my role as Managing Member of existing funds and maintain all my current company responsibilities. I will use twelve to fourteen weeks – sprinkled throughout the course of each year – for various pursuits, diversions and trivial indulgences. Nothing about this should cause much of a change because everything that has been achieved at Sequoia Capital has resulted from the teamwork and contribution of many people. Our overall business is in the best shape it has ever been and we are better positioned than at any time in our forty year history. Doug Leone will assume full responsibility for coordinating the business we have gradually developed over the past couple of decades and almost everything else remains entirely the same.